Just a little over a week ago I wrote of the fires that have been consuming East Tennessee. One of those fires raged out of control last night and destroyed over 150 homes and businesses in Gatlinburg. Just about all Knoxvillians have fond memories of Gatlinburg and the Great Smoky Mountains, and we are all grieving today. 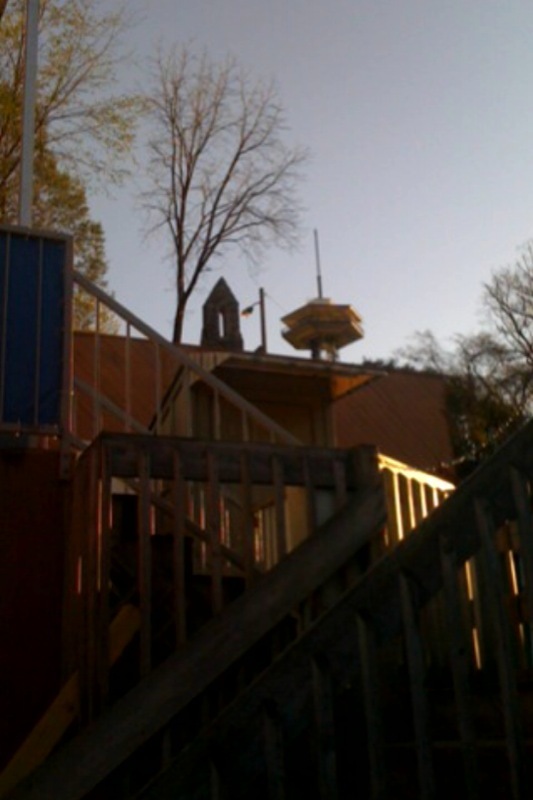 Thinking about all this made me remember this post, one of the first I ever wrote, which alludes to a side of Gatlinburg most people probably never see. My family and I spent part of our Easter Break in Gatlinburg. Most of our vacation time and money is used for trips to Baltimore to see my husband’s family, but we try to make little trips to Gatlinburg at Christmas or Easter. It’s close, there’s plenty to do, and we’ve found condos to stay in so that we don’t have to pay for two hotel rooms and can cook some of our own meals. Despite living so close to the Smokies, my family rarely visited when I was a child. Once a year at the most we picked up some fried chicken at the Kentucky Fried Chicken at the last stop light in Gatlinburg–it’s still there!–and took it to Metcalf Bottoms for a picnic. 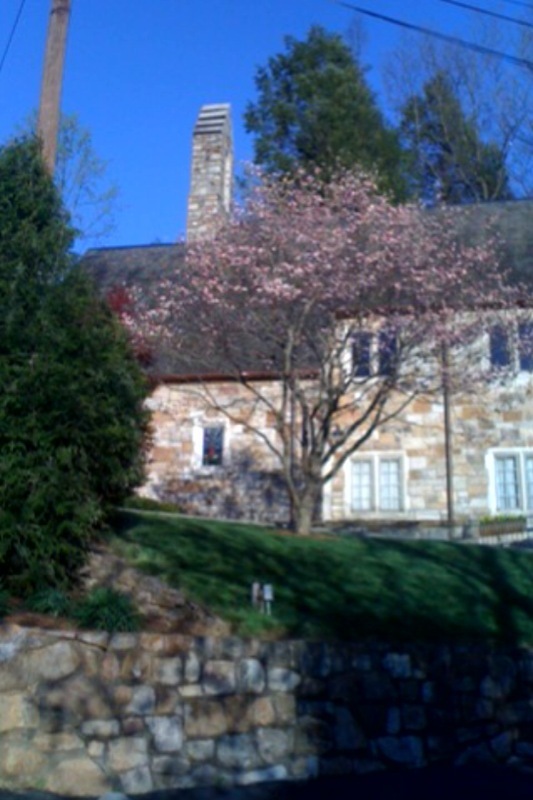 My father hated Gatlinburg so we hardly ever stopped there, although we did stay at the Glenstone Lodge just one time. 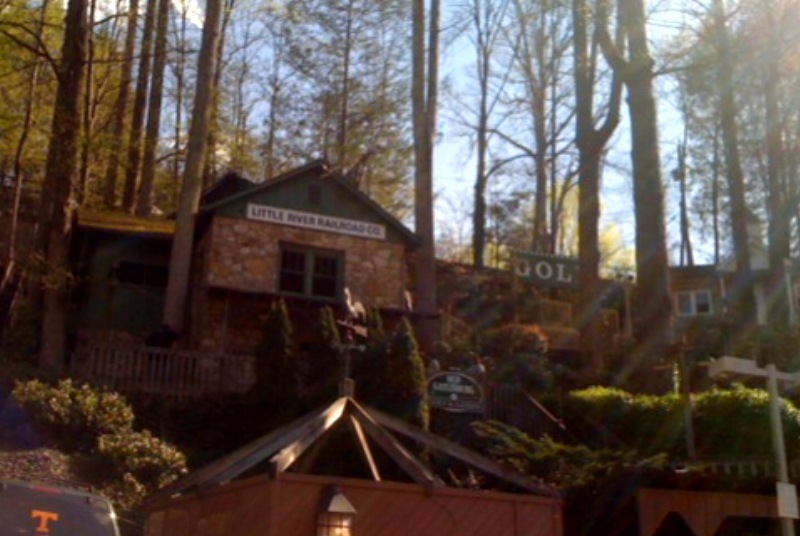 Gatlinburg has changed a lot since those days–it’s even changed a lot since I was in college. The family owned gift shops that used to line the streets (like Rebel Corner, which was lost to a fire), full of hokey gifts like Indian headdresses and souvenir shot glasses, are mostly gone now. In addition to a lot of tacky t-shirt shops and martial arts stores, there are many nicer gift shops. Ripley’s seems to have taken over the town. I do love The Village. Anchored by the 50-year-old Pancake Pantry, this copy of a old-time European town is attractive and peaceful, and we love the German restaurant there. The golf course at Reagan Terrace Mall is well done too, with little plaques at each hole that detail the history of Gatlinburg. There’s more to Gatlinburg than the main strip, though–there’s a side of it that many tourists never see. It reminds me of those Old West Towns with their false fronts, which made the little buildings behind them seems fancier, with two stories instead of one. That strip isn’t the real Gatlinburg. Back behind it there are homes and neighborhoods. And there’s history. 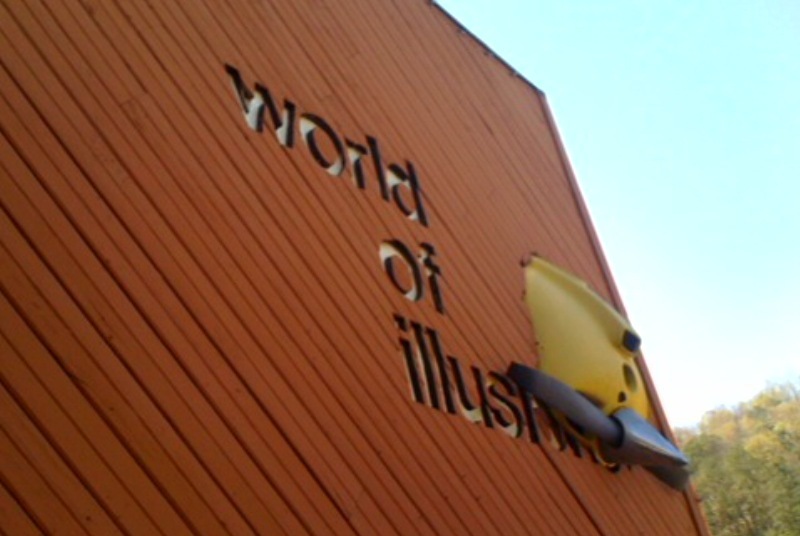 We discovered some of it when we were there. Keep reading this blog and you will discover that there’s nothing I love quite so much as a stroll through a graveyard. 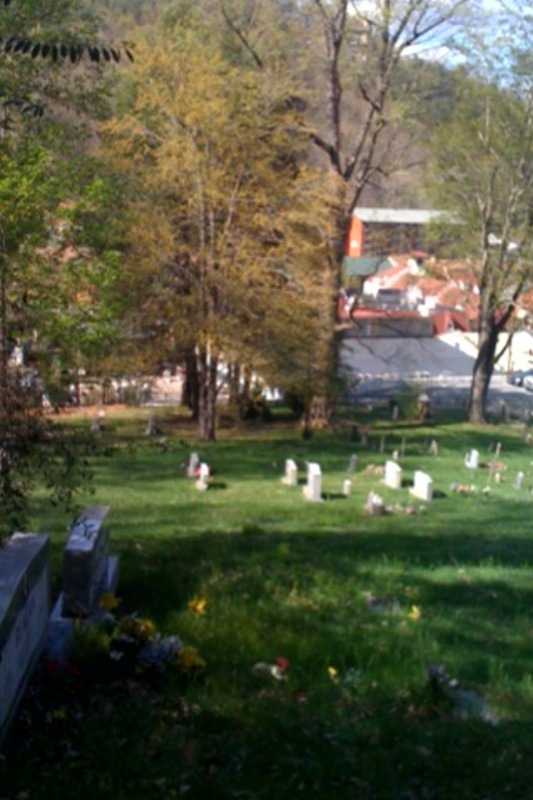 Taking a shortcut, my teenagers discovered an enormous cemetery that was established in 1830. In nearly 40 years of driving through Gatlinburg, I had never seen it or known that it was back there, just one block behind all the excitement. My little boy kneels by the stone of an infant, which made him sad. From the graveyard, you can see all the activity down below, all the changes that have come about since 1830–really most of them since 1930. 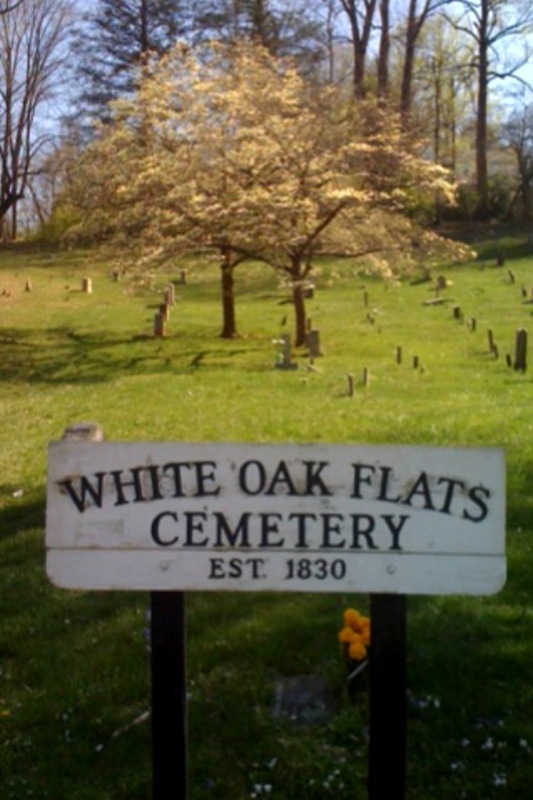 Yet the graveyard remains, testimony to the Gatlinburg that once was White Oak Flats, and most of all to the Ogle family, who were the first settlers. My children have learned to enjoy visiting cemeteries along with me. Two nice surprises in the graveyard: this trillium (I think!) . . .
and my Great-Uncle Clayton’s grave! I had no idea he was there! The graveyard wasn’t the only surprise in store for us. We found a shortcut back to our condo that took us right past this lovely Methodist church. Look at the interesting contrast in the photo below. I call it “Two Spires” and it’s a view of the steeple of the church above juxtaposed with the top of the Space Needle, as seen from Reagan Terrace Mall. Please consider donating to help alleviate some of the suffering of those who have been affected by this tragedy. There’s a partial list of efforts available here. Christ is risen from the dead! Alleluia, Alleluia! I too discovered this cemetery during spring break in 1985 but did not really explore it. I did notice the Watson name and was not surprised to find out years later in my own genealogical research that Rachel Ogle Watson, my great grandmother, is buried there along with other relatives. It Is a neat cemetery! Very cool! 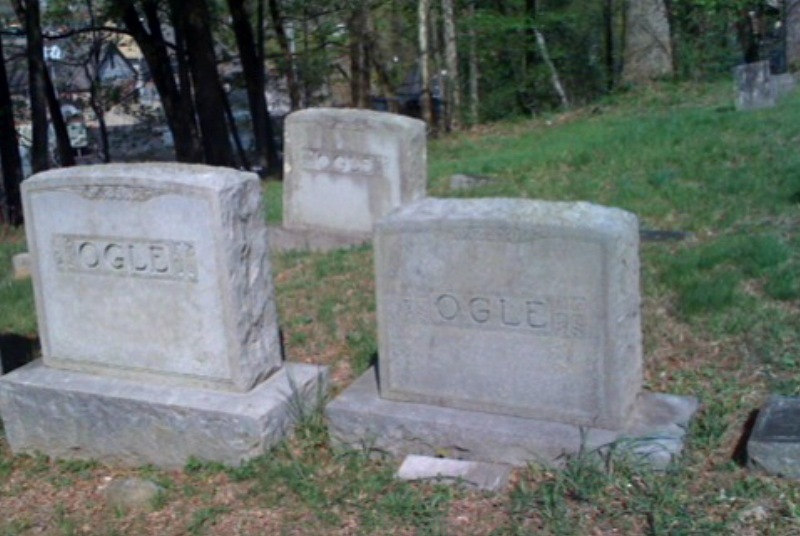 So you’re related to the Ogles? Big name up that way! The fires are awful, such a tragedy! I hope the community is able to come together and rebuild so more of us have a chance to experience Gatlinburg’s wonders. It is an incredible community and that is already happening. I expect we will come to that someday. And now many people are choosing cremation because of the expense. Beautiful thoughts. Fires are so devastating and you know that better than most of us. Indeed I do. Thanks, Kathleen. So many tree and hills! It is just so flat here, It is weird to see a cemetary on a hill like that. LOL. I can’t stand flat places. We went to Minnesota this summer and drove home through a lot of flatness. I can’t stand being able to see so far! I breathed a sigh of relief when we entered Kentucky and the landscape changed. It’s all about what you are used to, I guess.